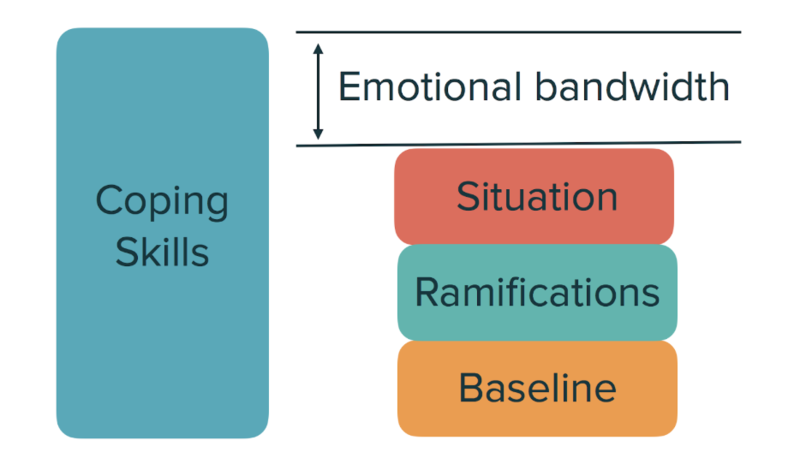 The four components of customer anger I outlined last week—the situation, its ramifications, baseline stress, and coping skills—apply to you and your team, too. We all carry baseline stress with us into our work days. Adding to that, dealing with an angry customer presents a stressful situation, can have ramifications on your job or for your business, and, like everyone else, your own coping skills can be affected by your physical state. This is true whether you’re a frontline customer service agent, or a supervisor taking over a call. The absolute last thing an angry customer needs is to be met with anger or apathy. So, how can you avoid that? Consider the wise words of Jenny Dempsey, social media and customer experience manager for NumberBarn, who says, "In order to take the best care of others, you must first take the best care of yourself." The question is, how can you maximize your emotional bandwidth to prevent stressful situations from getting to you? As the airline safety-training videos say, you’ve got to put the oxygen mask on yourself before helping the person next to you. There are many approaches to improving one’s coping skills and resiliency, and getting enough fuel and rest is an important part of that. Think too about your own baseline stress—are there are ways to improve some of these situations, or to set them aside when you’re at work? As a customer support leader, you can decrease your team’s stress around ramifications by assuring them that their jobs aren’t at stake if they make an honest mistake. There are also a number of things you can do during or after a difficult interaction to help feel calmer and reset for the next customer, so that they get the best version of you—and the best customer experience you can deliver. It’s important not to let each customer interaction add to your baseline stress. Take a deep breath. Breathe using your diaphragm, not your shoulder. And then do it again. Straighten your posture and stretch. Roll your shoulders and neck, or wherever you carry tension in your body. Smile. Think of something you love, or something that makes you laugh. Smile genuinely—a tense grimace doesn’t have the same effect. Hydrate. Long calls can leave you thirsty. Keep those vocal cords from drying out by drinking enough water. Listen to some favorite music. Let yourself savor the sounds that you love. Take a walk. Walking has proven to be advantageous at work, so stretch your legs and take a stroll around the office, up and down stairs or around the block. Socialize. Strike up a short conversation with someone or process the call with a peer or supervisor. Look at some cute pictures and videos... Am I right? Puppies, kittens, babies... the internet is your friend here. Finally, a caution: be careful about "venting." While it can be cathartic to process tough experiences with peers who can understand your pain, this can be counterproductive if it leads to disdain for your customers. Remember that even your difficult customers are fighting battles you can know nothing about. So, take care of yourself, but not at the expense of your customers, or your empathy. If you’re a supervisor, your team will have to handle tough calls from time to time (hopefully not too often). Providing employees with a chance to reset can greatly improve the team’s ability to focus on subsequent calls or interactions. If forced to keep going without a break, employees will build baseline stress that can lead to mistakes and even burnout. And burnout leads to attrition and turnover, which costs your team expertise and productivity. It starts by noticing and asking, "Are you okay?" Let your employee know that you’ve seen their effort and the impact of the interaction (or perhaps cumulative effect of a day’s interactions). Offer to take on the tough interaction by asking, "Do you need to escalate to me?" Do something small and thoughtful, like bringing a beverage or snack. Reflect back: "That sounded tough." This lets the employee know they’ve been seen. Offer a (work-appropriate) hug. We’re all people here, and a hug can go a long way. Some of these may seem simple, and many of them are—easy wins to ensure that your team feels recognized for the hard and emotional work that they do. Encourage everyone on your team to look out for each other—steps like these don’t have to be limited to managers and supervisors. Another more "outside the box" method that can both recharge your team and help strengthen their empathy muscles is to perform public service by volunteering in your community. Zendesk partnered with Drexel University on a study that showed that the Zendesk customer advocates who volunteered at least once every two months were more than three times as likely to be rated among the top third in the company for empathy. They were also more likely to seek help from their colleagues and had higher job satisfaction. This is something that takes some investment to put together, but can pay off in the long run. Having a better understanding of how anger works, knowing that your customer’s anger is not really about you, and giving yourself the self-care you need is great, but there are also particular skills that can help you talk down an angry customer so that you can help them. Addressing their issue as quickly as possible may seem like the best way forward, but going straight into "problem-solving mode" can actually be ineffective or even add to a customer’s anger. That’s because your customer’s emotions need to be addressed first. Enter the Metaphor! "Every ticket is a two-headed dragon: Emotional and Technical. If you don’t deal with the Emotional head, it will snap at you and defend the Technical head," says Ben Collet, director of global advocacy for enterprise and strategic accounts at Zendesk. Dragons are cool, and dragon-slaying is epic, but we shouldn't frame the interaction as a medieval-fantasy battle to the death. These are our customers we're talking about. Still, the two-headed dragon metaphor is useful, just think of it as taming the dragon, instead of slaying it, okay? Make the dragon your friend. There’s plenty of glory in that, and a lot less mess to clean up afterward. Dragons are cool, and dragon-slaying is epic, but we shouldn't frame the interaction as a medieval-fantasy battle to the death. These are our customers we're talking about. John C. Maxwell, an author and speaker focused on leadership, has said: "People don’t care how much you know, until they know how much you care." When someone is expressing anger towards you, whether in a business or personal situation, they need to feel heard before they can hear you. An angry customer may expect defensiveness from you and probably doesn’t trust that you’re on their side. They may feel misled, lied to, or even betrayed. In this state, any factual information you provide may sound like an excuse, and even empathetic messages may come across as insincere or even sarcastic (especially in text form, where tone can be harder to convey). 1. Choose your best channel. Conveying tone and showing you’re listening can be challenging in an email exchange. Offering to open a live chat or phone call makes it easier to communicate and shows you care enough to focus all your attention on this issue. But don’t insist on changing channels—a customer might not be in a good place to join a chat or take a phone call. 2. Give them the floor. Let the customer say their piece without interruption. Don’t worry, you’ll get your chance to speak, too. 3. Use "verbal nods" to show you’re listening. In a phone call or chat, quick responses such as “I see,” “uh-huh,” “right,” “okay,” “mm-hm,” etc., indicate that you’re following along without stopping the customer’s flow. 5. Reflect what you hear back. Ask “Can I reflect back what I heard?” and start with “I hear you’re feeling upset about…” If they’ve used a word (angry, pissed off), use that to help prevent them thinking you’re minimizing their feelings. Reflect their version of the situation as best you can. This isn’t the time to correct them if they’ve got something wrong. 6. Validate the way they feel. Consider how this is making them feel, and try to embrace that. “I’d feel that way, too” or “I can understand how frustrating that would be” are examples of how you might phrase this. Sincerity is crucial, so really try to see the situation from their perspective. 7. Apologize genuinely, when appropriate. This can be as simple as “I’m sorry you’re going through this.” If someone is having an unpleasant experience, it’s okay to be sorry about that. That’s not committing to a specific action to rectify the situation. Whatever you do, don’t apologize for their feelings (“I’m sorry you feel that way”), since that can feel dismissive. 8. Provide reassurance. Let the customer know you’re going to do everything you can. Just don’t make commitments you can’t keep; you may not be able to promise a refund, for example. This process isn’t foolproof, especially not on the first try. It can be a little like calming a wild animal (dragons are animals, right?). When you attempt to reflect their feelings, the customer may correct you even if you’ve used their exact words. That’s okay; it can be difficult to articulate anger. They may even launch into another tirade. Try not to get frustrated, just stick with them and keep trying to hone in on their feelings, provide validation, and reassure them that you’re on their side. You’re still there, you still care and you’re listening. Once you’re confident that the customer trusts that you understand their perspective and that you’re committed to helping them, only then should you proceed to working towards a solution. This is the point the customer is going to ask, “So what are you going to do about it?” That’s a good thing—it means you’re dealing with the “Technical Head” of the two-headed dragon. Here’s how to satisfy it and bring the matter to a conclusion. 1. Identify the “ask.” Does the customer want information? Do they need help setting up something, or troubleshooting something that was working before? Do they want a refund or replacement? The ultimate solution might be something other than what they’re asking for, but this is an important starting point. 2. Look for underlying needs. Sometimes a customer might not understand what they need. This isn’t always their fault—they may have misinterpreted information or have been misled by incorrect or incomplete documentation or advice. Or, they may have travelled down a rabbit hole looking for a solution on their own without the knowledge or expertise to correctly diagnose their issue. Don’t judge the customer for being wrong, but don’t follow them down that rabbit hole, either. Instead, ask questions to make sure you’re on the same page—and, the right page. 4. Be transparent. If you have a solution at this point, you can offer it, but it’s possible you may have bad news, are unable to provide an immediate answer, or need to (re)set expectations about what’s possible. Be frank and don’t sugar-coat the news, but keep their feelings in mind and know that this might reignite their anger. Prefacing bad news (“I realize this is not what you want to hear, but…” or “I wish I had better news for you” or “This is probably going to be upsetting”) can help show that you understand their position. In any case, provide all the information you can about the situation, the solution, or next steps. 5. Educate, empower, and encourage. Sometimes, what a customer needs is the knowledge and confidence that they can solve the problem on their own. Pointing them to the necessary information, walking them through the steps to the solution, and being a cheerleader when they accomplish their task can help turn around an otherwise unpleasant encounter. Offer phrases like, “That’s it!” or “You’re on the right track” or even an “I can see how you got there,” when appropriate. 6. Offer workarounds. You won’t always be able to offer a solution. But sometimes there may be a different way around the customer’s problem. Take the time to explore these possibilities. Your customer may not be thrilled at the idea, especially if it takes extra work to deliver something that’s not quite what they want, but they’ll usually appreciate the effort to see them through. 8. Follow up. If there are action items you can take, like escalating the customer’s issue to another team, asking your documentation team to add a clarification to your public-facing knowledge base, advocating for a change to your product, service, or policies, make sure that you follow through. Don’t commit to something you can’t accomplish, but if you do commit, don’t drop the ball. Keep in touch with the customer if possible and let them know when you’re able to get a change implemented. This allows you to build a relationship that will show your customer that you truly care about their experience. Anger shows that a customer is engaged, and when they reach out, they’re giving you a chance to fix things. Hopefully, at this point you’ve been able to resolve the situation and restore trust between your customer and your company. But sometimes issues aren’t as easy to resolve, and your customer still may not be happy. Even with a happy ending, there was some rough road getting there, and an unpleasant experience that prompted the interaction to begin with. If you’ve worked these steps and the customer doesn’t leave smiling, it’s not a failure. At the very least, you can feel good about doing all you could, and they will likely respect the effort. They’ve been heard, they’ve been listened to, and you’ve empathized with them. Now it might be time for a bit of that self-care we talked about earlier so you can set aside whatever stress you experienced during this encounter, and be ready for the next customer. Most likely, your next conversation will be easier. Something’s wrong in the IoT. Who you gonna call?